The Standard Furniture Sonoma features the handsome details of rustic Misson styling, giving this grouping its comfortable, easy to live with ambiance. From its sturdy proportions to its warm and mellow oak color, Sonoma perfectly fits the casual dining traditions of today's home. 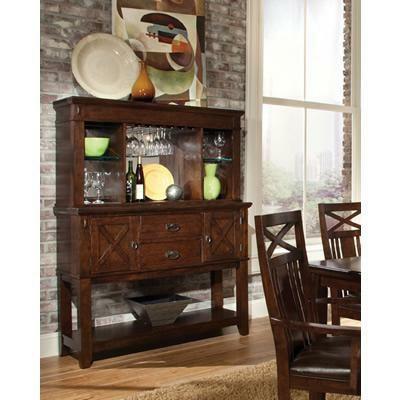 The sideboard features two doors and two drawers for dining storage needs, plus a bottom display shelf. It is paired with a low profile Sideboard Hutch having glass shelves for additional open display space for china or barware.